THE GIANT SEQUOIA grows only on the western slopes of the Sierra Nevada in central California, at elevations of 4,000 to 8,000 feet, in a narrow belt for a distance north and south of about 250 miles. The most northerly grove of six standing trees is on the Middle Fork of the American River in Placer County, and the most southerly is on Deer Creek in Tulare County. The trees do not grow in a continuous belt but occur in more or less scattered groves, approximately 63 in number, which contain from as few as six up to many thousands of individual trees. The northern groves are relatively small and widely separated, but south of the Kings River the groves approach forest dimensions, are more closely spaced, and occasionally are almost connected by scattered individual trees. The giant sequoias always grow in association with other trees, except in a few groups where the density of the Sequoias prevents their lesser associates from entering the area. In most of the groves the forest is composed of white fir, sugar pine, ponderosa pine, incense cedar, and Douglas-fir, with the giant sequoias scattered as individuals or groups throughout the area. The forest floor is covered with lupines, dogwood, ceanothus, chinquapin, azalea, alder, and willow. Many beautiful grassy meadows covered with a multitude of ever-changing flowers are found within the groves. Many of the giant sequoias are far from the beaten path in rugged mountain country, still almost as little known as they were when first discovered by the white man, so that the visitor has somewhat the exhilaration of an explorer discovering a new form of life when he comes upon them. In all the groveseven those most heavily visitedone has a deep feeling of peace and reverence, as within a cathedral. The giant sequoia is among the most limited in range and number of individuals of any of the major tree species. 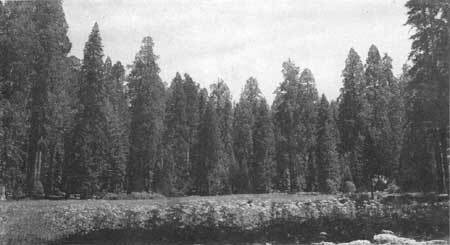 A complete count of all of the larger giant Sequoias has not been made, but the trees of many groves have been measured and plotted on maps. Estimates based upon these counts, however, indicate that there are probably fewer than 20,000 giant sequoias in the world more than 10 feet in diameter, although there are, of course, many times this number of smaller specimens. The total area occupied by the giant sequoia groves probably does not exceed 15,000 acres. Reproduction does not occur naturally to any great extent outside the limits of the groves and is relatively scarce within many of them. In almost no grove, however, is it entirely absent, and well-scattered trees of all ages, from seedlings to venerable giants, may usually be found. The species is apparently in no danger of early decline in numbers or area from any known natural causes. FIGURE 7.Beautiful grassy meadows with a multitude of ever-changing flowers are found within the groves. Round Meadow, Sequoia National Park.